Complete the look of your bath with this Trinsic 30 inch Towel Bar. Delta makes installation a breeze for the weekend DIYer by including all mounting hardware and easy-to-understand installation instructions. Matte Black makes a statement in your space, cultivating a sophisticated air and coordinating flawlessly with most other fixtures and accents. With bright tones, Matte Black is undeniably modern with a strong contrast, but it can compliment traditional or transitional spaces just as well when paired against warm nuetrals for a rustic feel akin to cast iron. You can install with confidence, knowing that Delta backs its bath hardware with a Lifetime Limited Warranty. Align 9-inch Hand Towel Bar in Matte Black From large, open master baths to minimalist powder rooms, Align faucets and accessories bring a refreshed modern look to your home with simple lines and contemporary style. 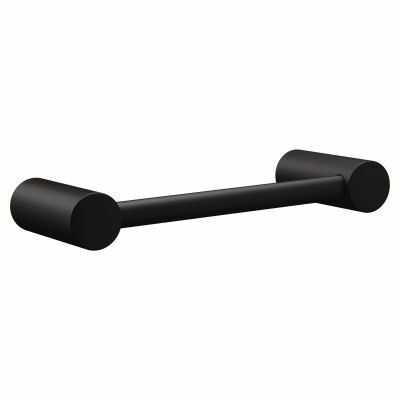 Align 9-inch Hand Towel Bar in Matte Black is rated 4.9 out of 5 by 20. Rated 5 out of 5 by Ktie88 from Easy to install and matched perfectly to existing fixtures.... Easy to install and matched perfectly to existing fixtures. Rated 5 out of 5 by Denise from I placed this towel bar between two rectangular mirrors above... I placed this towel bar between two rectangular mirrors above the bathroom vanity since I have little wall space by the sinks. It is a perfect fit and color. The style is modern and will hold a folded hand towel or fingertip towel. Easy to install. Rated 5 out of 5 by Nicky from Perfect small towel bar for powder bath. Great for... Perfect small towel bar for powder bath. Great for a hand towel on small side of vanity. Rated 3 out of 5 by Lindsay from I wish it were wider, but we are making it... I wish it were wider, but we are making it work. Don’t know that I would purchase these again. Rated 5 out of 5 by Marcela from This hand towel bar is very attractive, sturdy and functional.... This hand towel bar is very attractive, sturdy and functional. It doesn't take a lot of space and is perfect for a small bathroom where space is at premium.